March 5 – March 8, 2018. “Moose!”, Duwan exclaims as we pull into El Mirador campground. 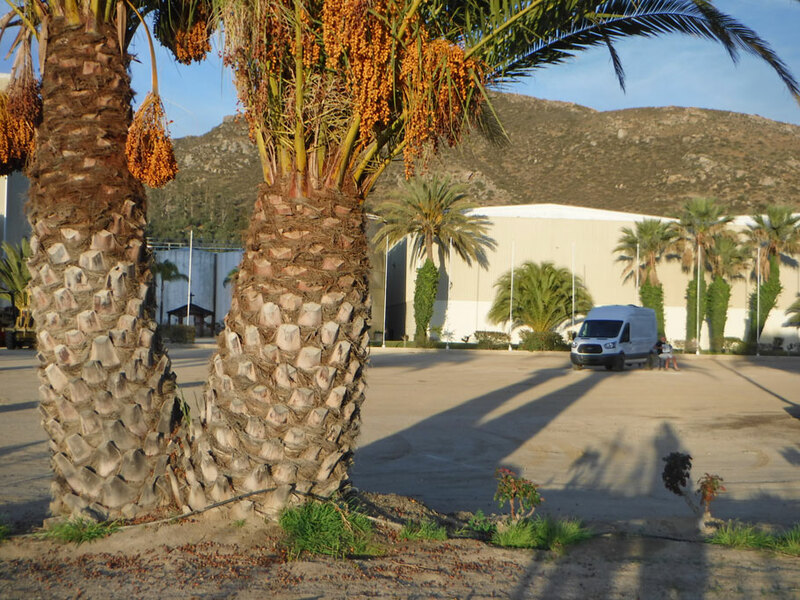 Leave it to Duwan to recognize a dog she knows out here in Baja California. She hops out to greet Moose as I find a level parking spot. Duwan has been following Moose’s person, Tim, on Instagram. After I park, we meet Moose’s whole family (Tim, Kerry, and Byron [Moose’s furry brother]). El Mirador is our third Baja camping spot, and favorite so far. But I’m getting ahead of myself. I should backtrack to our border crossing on Monday, March 5th. It wasn’t difficult. But nothing about it was intuitive. I was glad Duwan had researched it so thoroughly. We drove across easily enough, and were waved into a parking spot. Two agents opened the back of the van and looked in. Not a very thorough search. 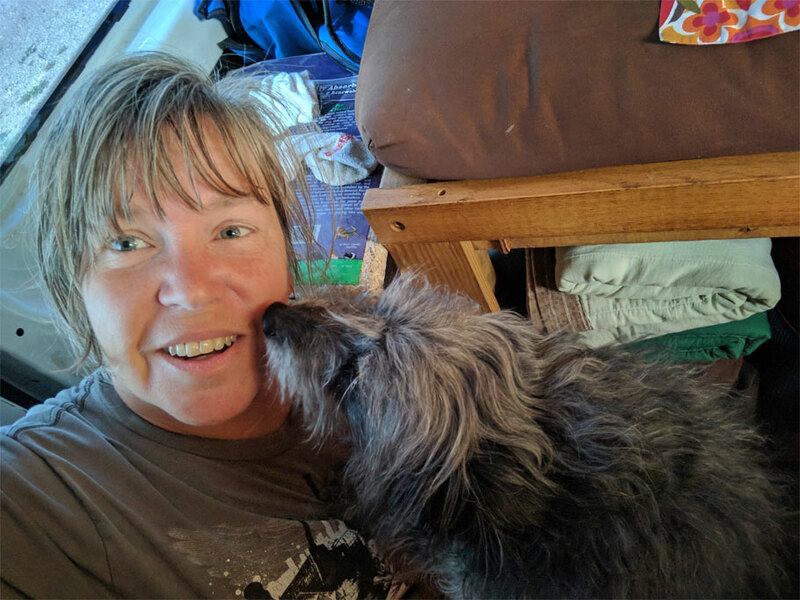 I suppose looking like harmless old gringos helps sometimes. Then we were waved off. We drove across the border. 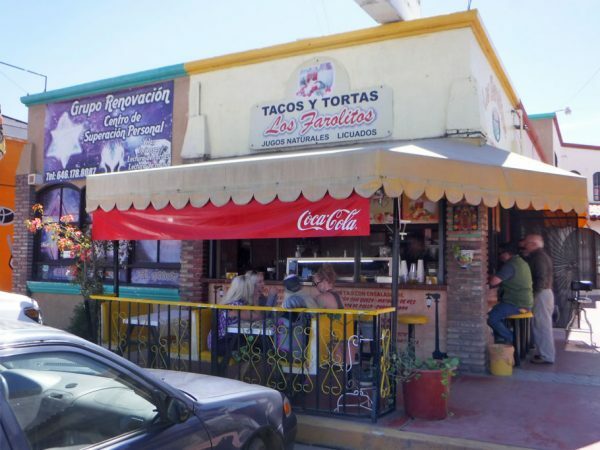 Next step was finding a parking space in Tecate, preferably a short walk from the border office. It took a while, but we found one. We gathered all our paperwork and walked back to the border facility. Someone eventually pointed us to a gate on the east side of the road. We walked up a sidewalk the length of the facility, and crossed the road we had come in on. Then we walked back toward the border, past the Banjercito, and found immigration. 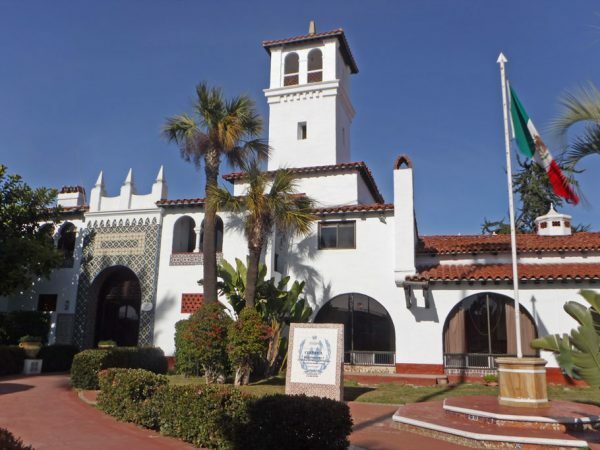 Here we filled out Mexican travel cards, and were sent back to the Banjercito to pay. We took our Banjercito receipts back to immigration, and had our passports stamped. 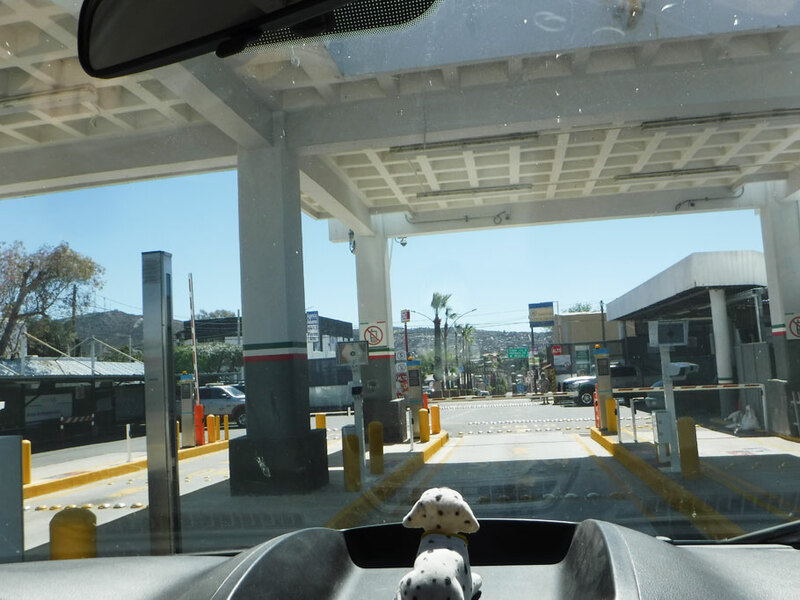 Then we walked down the west side of the road, through the Xray checkpoint, and back into Mexico. We were legal. We changed some money at a booth in Tecate. The rate was 17.35 pesos to the dollar. 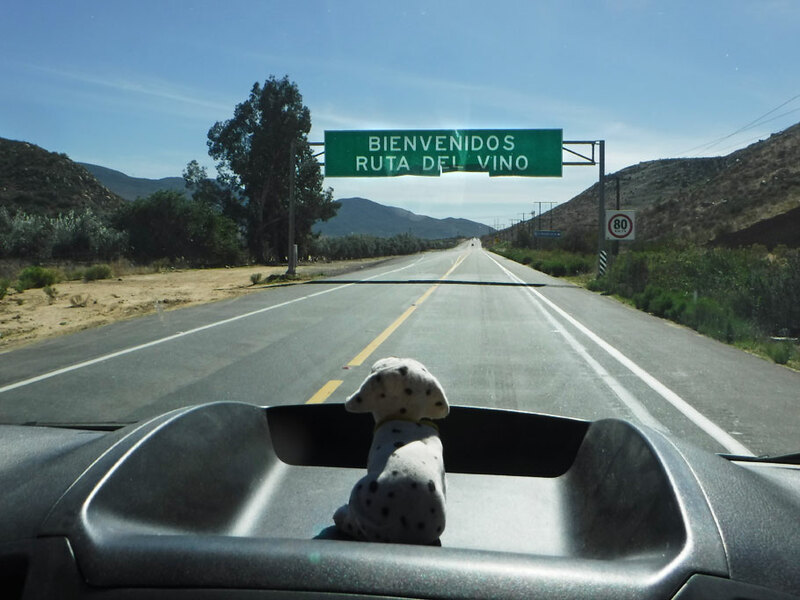 Then we drove out of Tecate on highway 3, which quickly becomes La Ruta del Vino. 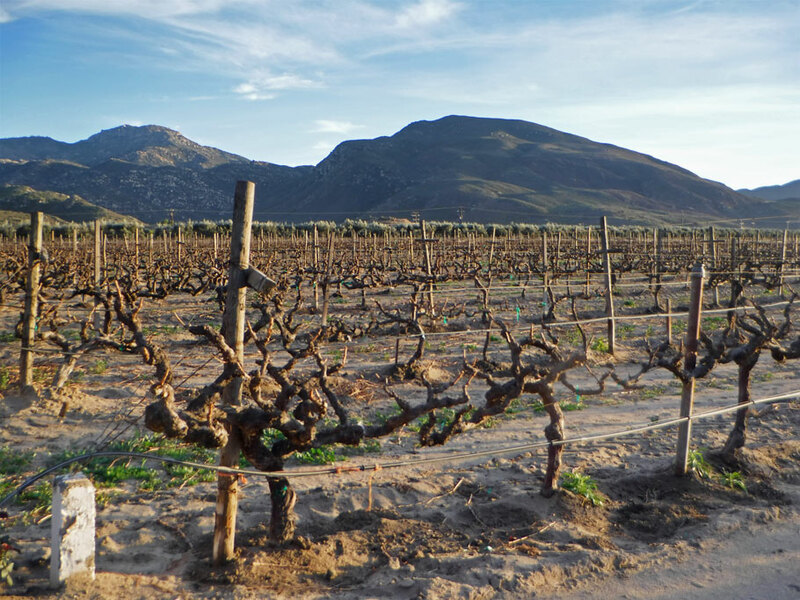 Yep, just like it sounds, this stretch of highway 3 is lined with vinyards. Our iOverlander app had told us that some of these allow free overnight camping if you buy a bottle of wine, or take a tour. It’s true! 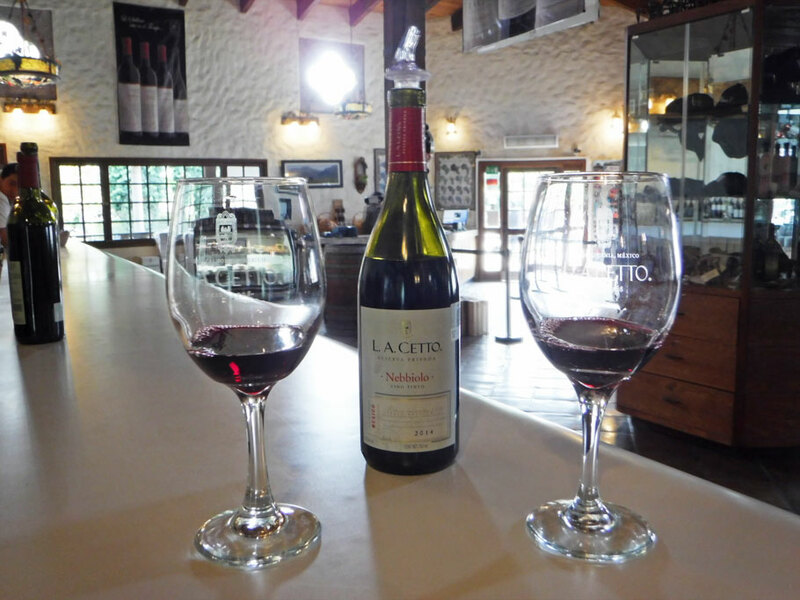 Our first night was spent at L.A. Cetto. Our next stop was in downtown Ensenada on the Pacific coast. We parked in a free spot near the water, and explored the city. There are other camping options nearby, but we just stayed the night in that spot. 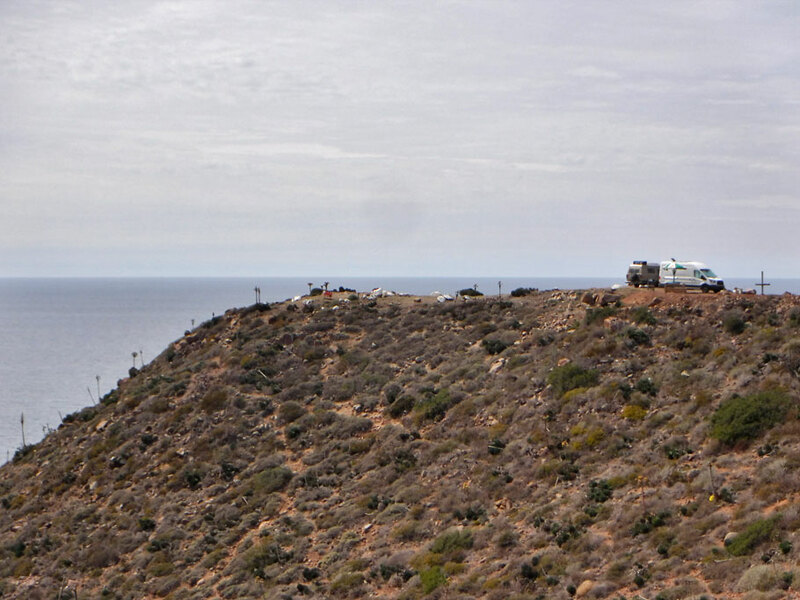 The next morning we decided to drive out the point south of Ensenada to La Bufadora. We passed several camping spots and selected El Mirador, which has dry camping for $5 per night. We stayed two nights. Here are some quick rounding techniques I use. A kilo is just over two pounds. TenK is just over 6 miles. And dividing pesos by 100, and multiplying the result by 6 will give me a rough value in dollars. Produce in grocery stores is cheap, but you may not find bagged greens. There is no cheddar cheese in sight, and no pretzels. Aaargh! But Carta Blaca, the cheapest beer besides American light beers, is drinkable. Oh, and don’t forget to tip the grocery bagger one peso per bag. 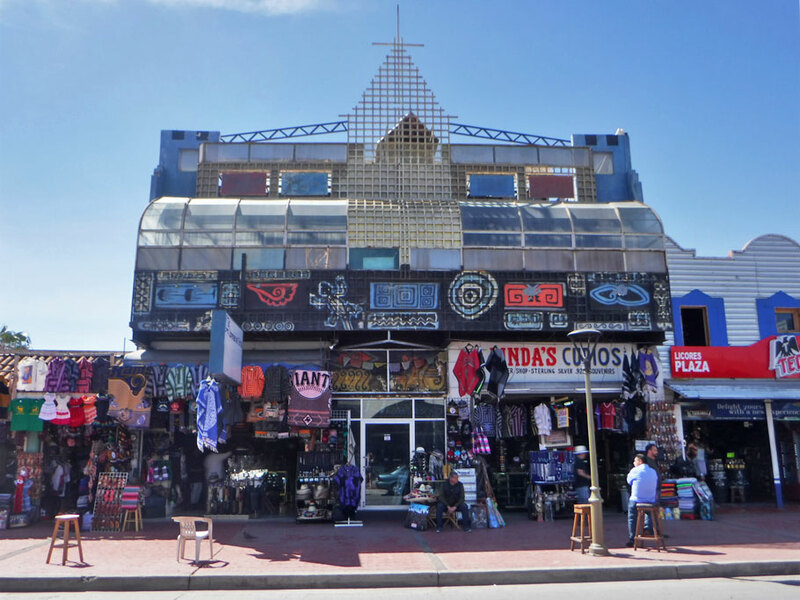 We’ve learned to be wary in tourist towns like Ensenada. We stopped into a bar for a few beers, where we were dramatically overcharged, spectacularly underserved, and got to watch two waiters fight over sharing the expected tip. And at a fruit stand I paid someone for a bag of oranges. As we took time to select the best bag, the urchin I paid ran off. No one noticed that, but they did notice when WE started to leave with a bag. The government sets the gas prices here, so it’s pretty much the same everywhere. But you don’t pump your own. So try to know how much you’ll need (in liters), and have exact change (in pesos). Make sure the pump is reset to zero before the attendant starts. (Try to remember his physical features.) If the attendant reaches for hose on othher side of the pump, get out for a yawn and stretch, making sure he resets that side to cero. Dismiss the panhandler who engages you while the pump is running. And before handing the attendant money, count it out aloud, making eye contact, so there’s no confusion. And don’t forget to tip him! What have we learned about driving? Four-way stops are common. If bulbs on a traffic light are out, just treat it like a 4-way. 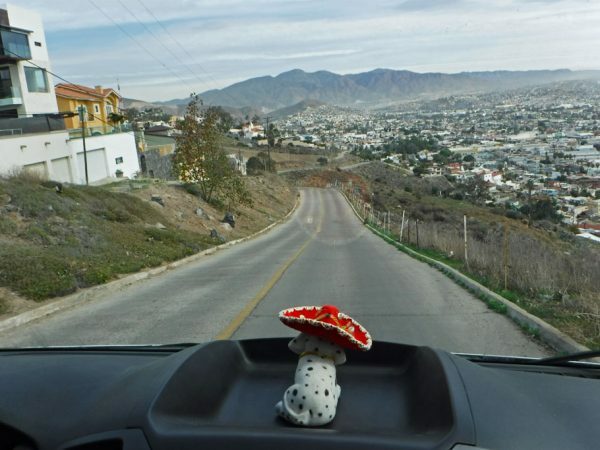 Everyone, everyone, everyone wants to drive faster than Ballena Blanca, even when we’re over the limit. Don’t sweat it. In towns the roads are cratered like those in Atlanta, home! The long highways are mostly two lane with wide (but less than car-width) aprons on each side. A solid yellow line means no passing. A double solid yellow line means “Really! No Passing!” No one, no one, no one respects these lines. People commonly pass. And, surprise! Don’t use your left signal if you plan to turn. Use it to show the person behind you it’s OK for them to pass you. And the topes! These are (seemingly) randomly placed, frequently unmarked, speed bumps. They may be for pedestrian crossing in the middle of nowhere. Or they may stretch, inexplicably, through an entire poblado (village). Varying heights, they lurk, waiting to rip the undercarriage from your vehicle. 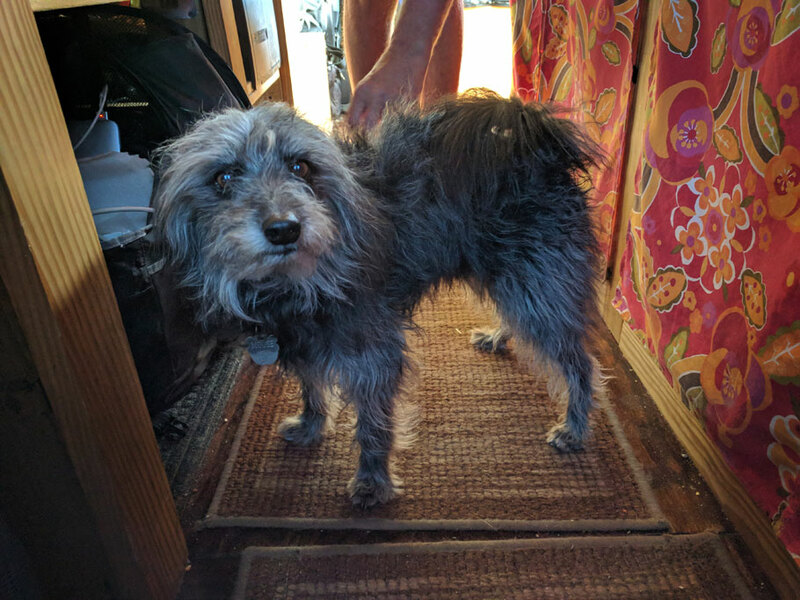 But despite our great white blundering down the peninsula, despite the fact that the big dumb gringo van is clogging up the works, no one has honked at us. No one has flashed lights, tail-gated closely, or flipped us off. We’re just one more tope to these folks. Right now, this very minute, we both have bad colds. We suspect a germy handshake with one of our dueling waiters. But we are camped out in a great spot for 90 pesos per day (about $5.20) which includes WiFi and hot showers. And it is sunny today and we can hear the ocean sing and birds chirping. Not a bad place to be sick in Mexico. Approaching the border crossing. Bob has doffed his hat, so he doesn’t look like a party animal. Welcome to the wine route. 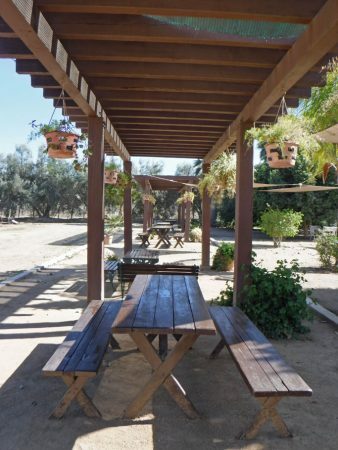 One of the tasting areas at this 90 year old winery. 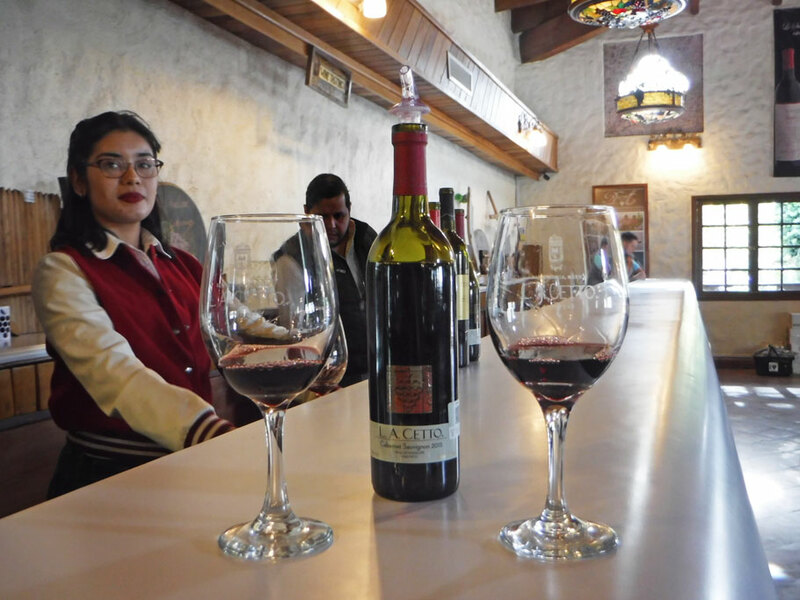 We were told that the average amount of wine consumed in Mexico is one liter per person annually. (Compared to 30 times that for Europeans and the U.S.) Here are the vats for the wines that are fermented for a year or less. These large oaken vats are where the one year plus wine are stored. 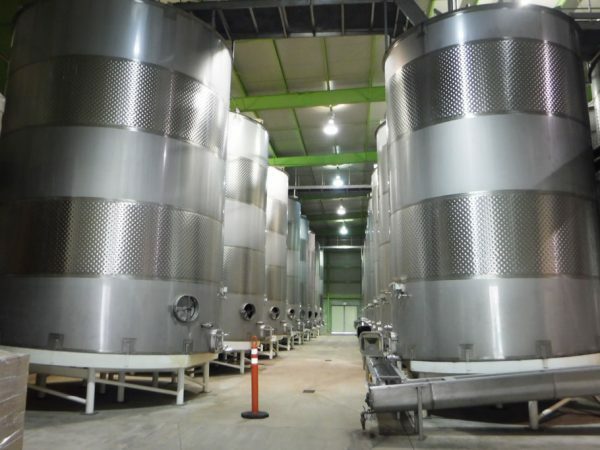 The vats are used for up to 30 years. 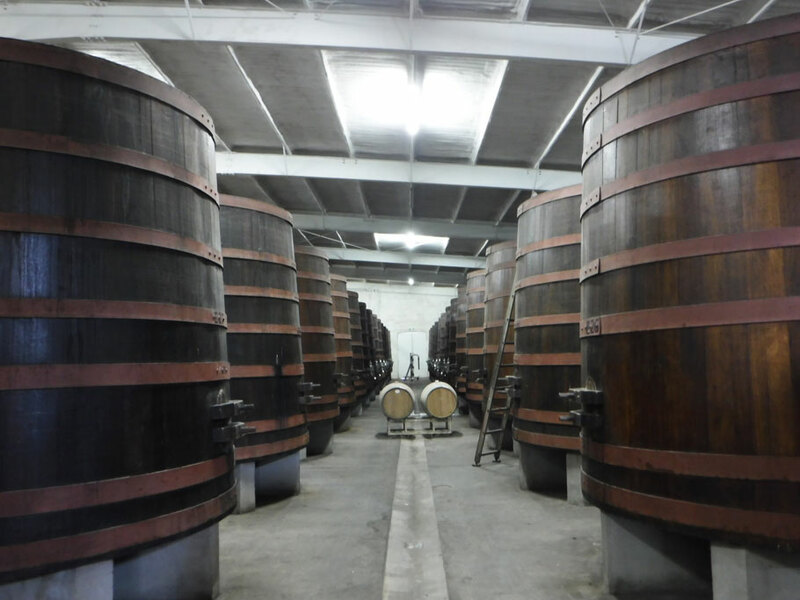 French oak vats for the select wines, which can age for up to ten years. The solera process is used for these. 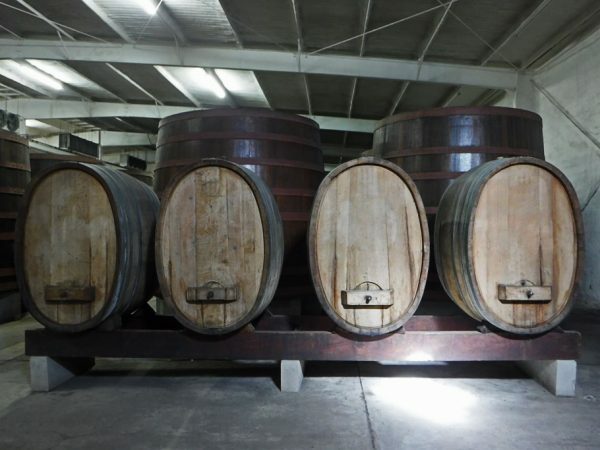 The oldest vat is bottled, the contents of the next oldest vat are moved up. Then the youngest vat is filled with the new batch. Some honored visitors have autographed this one. But we like the nebbiolo best, and bought a bottle. We ask to stay, and are sent to this gated parking lot in the back. We have it to ourselves. 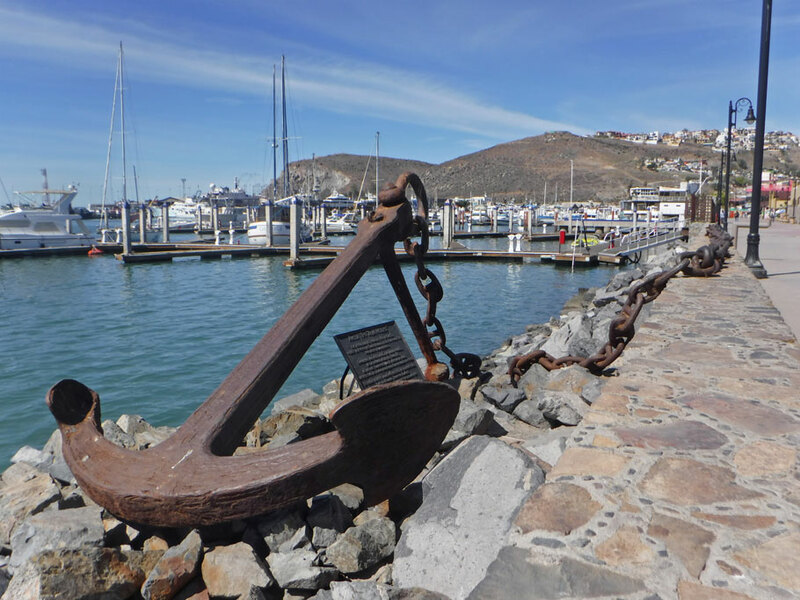 In Ensenada we stayed at the parking area near this marina. 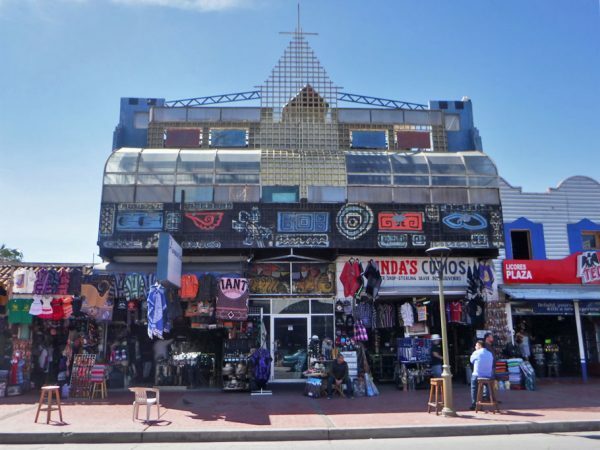 “The Riviera” in Ensenada. It houses a history museum, cultural center, and lots of large meeting rooms. 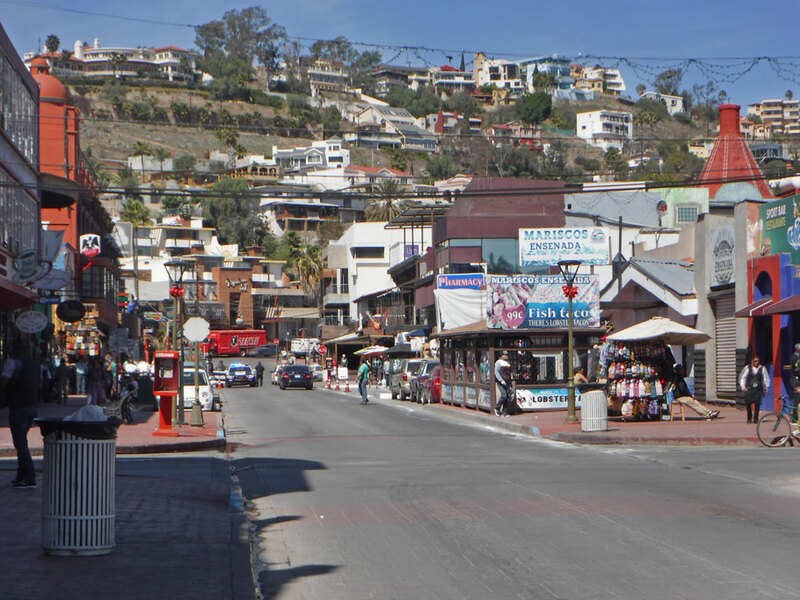 The three streets nearest the waterfront in Ensenada look a lot like this, with shops, restaurants, and bars that cater to folks coming off the cruise ships. 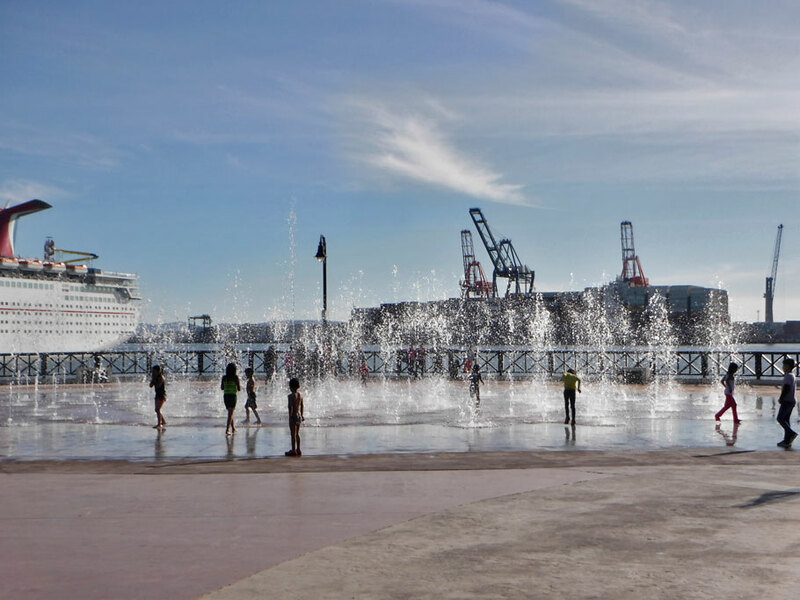 Kids playing in a fountain with cruise ship in background (left). We had lunch at this friendly, low key cafe eight or ten blocks from the waterfront. Delicious. We drove up to a northern vantage point overlooking the city, but there was no parking. 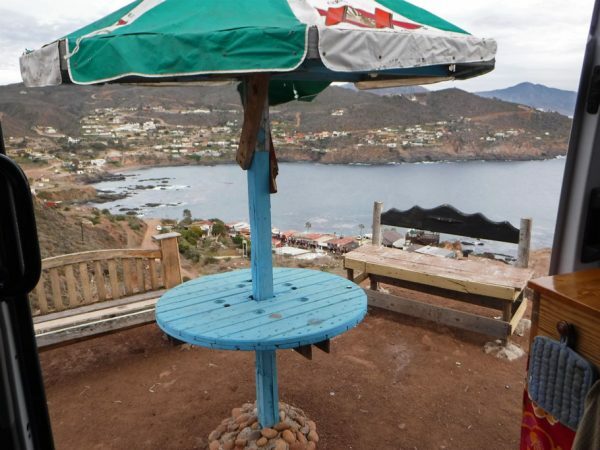 View of Bahía Todos Santos from the northern side of Bufadora Point. View looking south from Bufadora Point. The view looking out our side door. 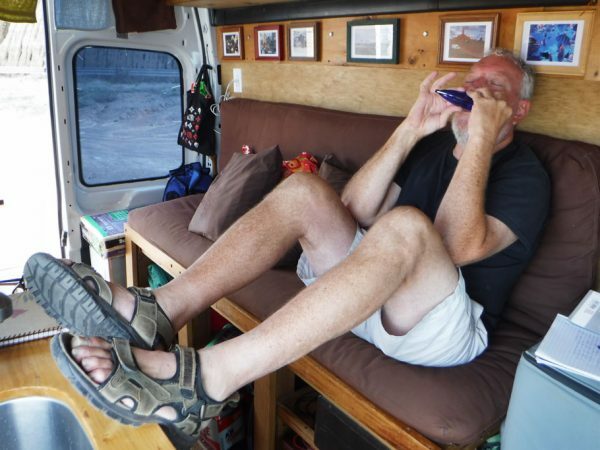 Greg picked up an ocarina in Ensenada. We walk down to the attraction at the bottom of the point. Lots of vendors line the way. They try to make sure you lack for nothing. 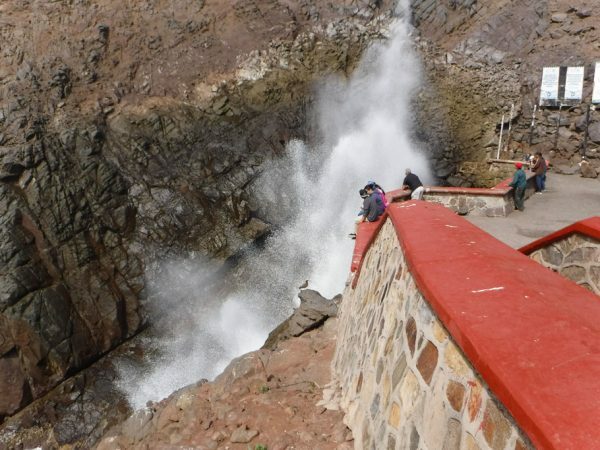 “La Bufadora” means “The Blow Hole” in Spanish. Below this observation point a wave gets compressed into a cave and shoots spray up into the air. La Bufadora. View of the campground as we walk back up the hill from the point. 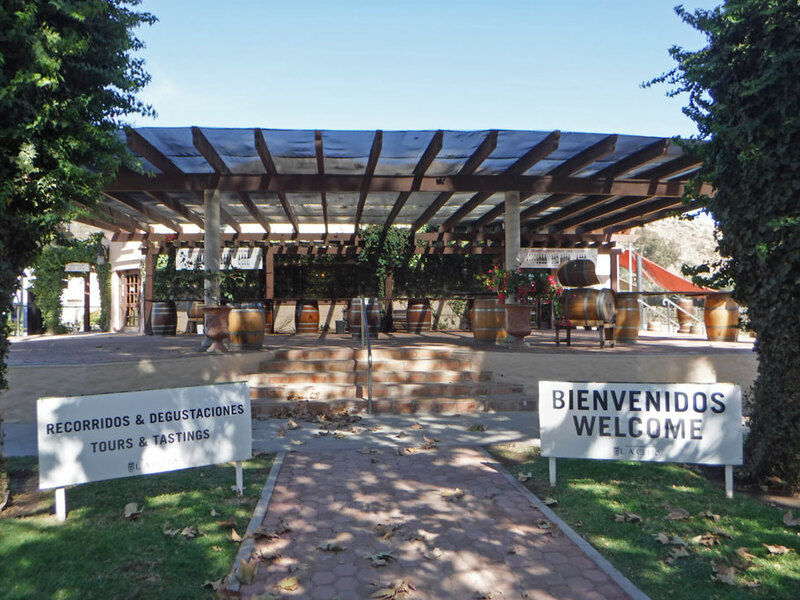 Now we have new neighbors at El Mirador. This couple and their kids are moving from Oregon to Black Mountain, NC. Their U-Haul came with a month of free storage. So they loaded it and left it. They packed tents into their car and set out for Baja. Maybe we’ll get to pick together again some day in Black Mountain. Moose gives Duwan a goodbye kiss. 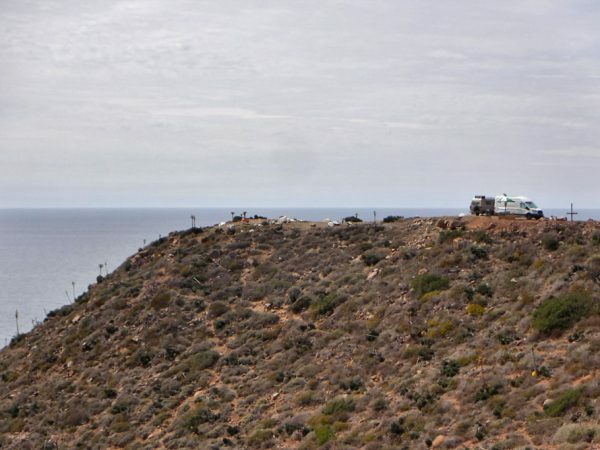 This entry was posted in Baja California, Mexico, Travel On The Dirt and tagged Baja California, Blow Hole, Crossing the Border, El Mirador, Ensenada, L A Cetto, La Bufadora, Mexico, Winery. Bookmark the permalink. Thank you, Donna! We are trying to rest and feel better. We have lots more Baja to explore. 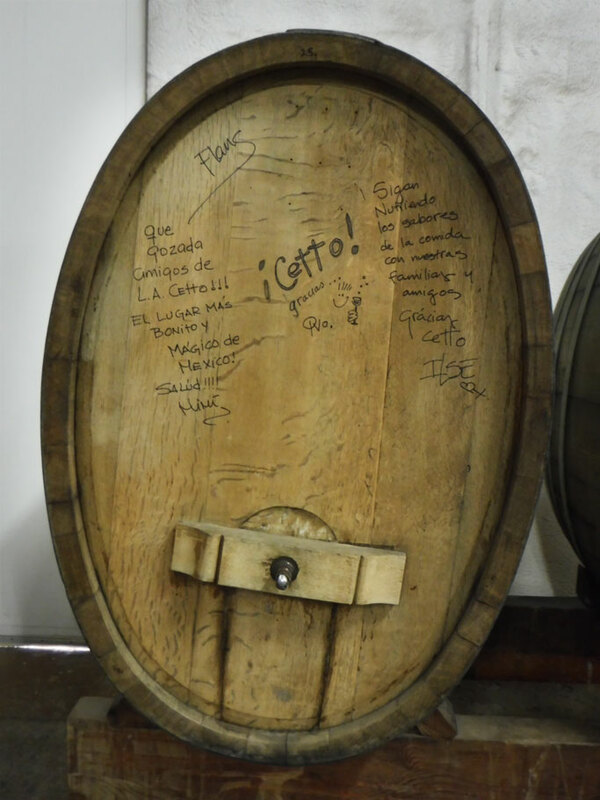 I discovered the love of L.A. Cetto on our trip to CMDF aka Mexico City. John, being a wine guy, was like “Of course they make wine in Mexico. 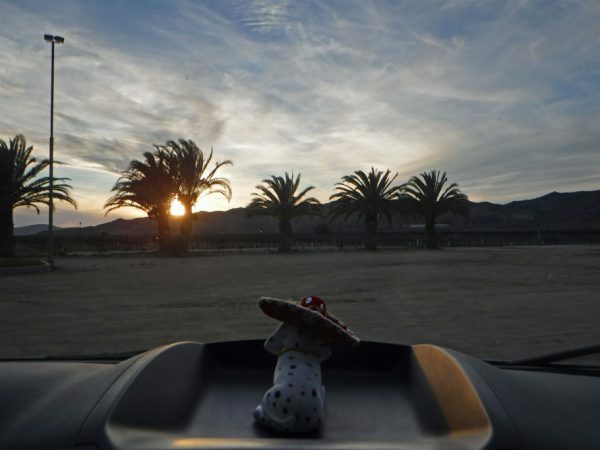 Baja is not so different weather-wise from Santa Barbara.” But it was a surprise to me. I liked that wine and was glad to have an option besides tequila or Sol after Day 5! Our tour guide at the winery said she was a tequila drinker, but was becoming a wine lover too. We haven’t had any tequila here, but I am tempted to try a margarita at happy hour. I watched the owner/bartender make one last night. It was mostly alcohol with a few squeezes of fresh lime. Duwan is such a good researcher 🙂 Is she sporting a new hairdo or is it just pulled back? Either way she looks cute. Hope you guys feel better soon. Colds are such a nuisance. That is my havent washed for days, just woke in the morning, haven’t combed my hair yet, pulled back hairdo. Glad you like it! This cold is a kilker. What a camping spot in La Bufadora !!! The colors in the sunset- muy hermoso…. The spot was pretty special! 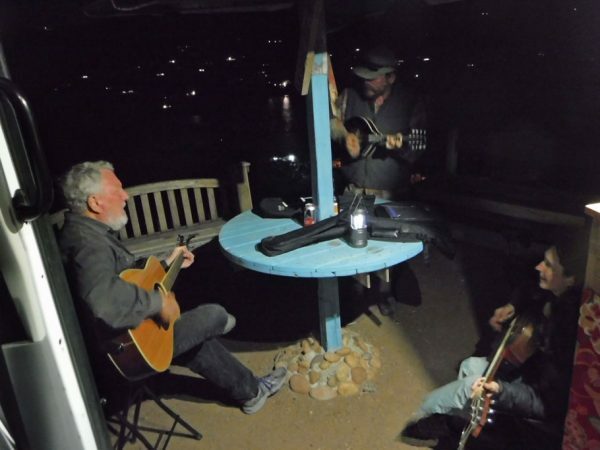 Wonderful views and great Pacific Ocean sunsets! Gusto. Mas Espaniol: La Bufadora! Hola Capitán Roberto! 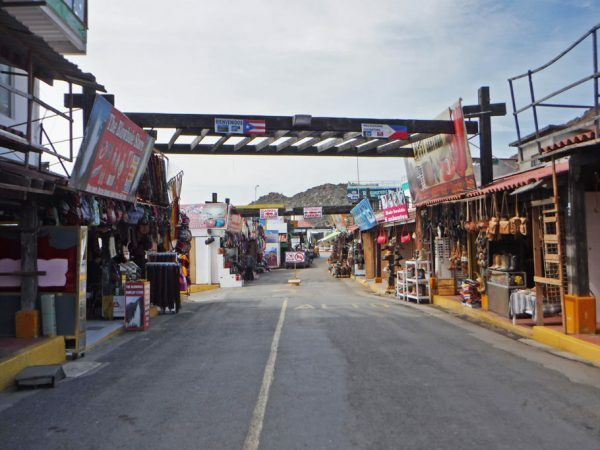 Habra más español a medida que viajamos al sur. Estamos aprendiendo mucho.